From Grasse, take the N85 for 40km then take the the D2 on the right for 18km. 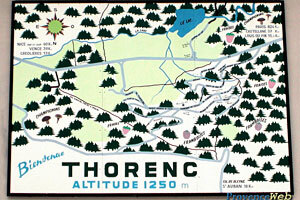 Thorenc is a pleasant health resort located beyond Grasse. As soon as you set eyes on it, you will immediately understand why Thorenc is known as the "Provencal Switzerland". 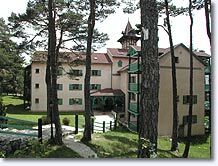 Thorenc resort is located on a vast high plateau, surrounded by splendid mountainous wooded landscapes (firs and poplars) that shelter it from the alpine winds. There is a small lake here where you can relax and cool off during the hot summer days. 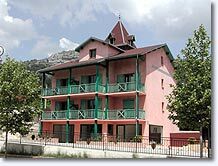 Thorenc possesses a strange charm that is likely to bewitch you: For example stroll along the tiny chemin des Tilleuls, it offers a fine vantage point for admiring the magnificent "beginning of the century" houses that it is famed for. You have to seek out these sumptuous houses concealed in the greenery of their grounds. 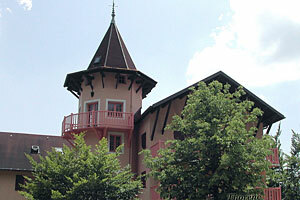 With their wooden turrets, walls and balconies, that are so distinctive and whose architecture betrays a most astonishing Franco-Russian influence, they provide proof that Thorenc was frequented as much by White Russians as it was by important families from Nice, at the beginning of the 20th century. Moreover, even in this day and age, you can still have your villa built in the "pure traditional Thorenc style", by a skilful local builder! 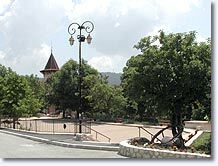 The history of the commune goes back to the Roman period, Thorenc has always been a strategic place. The XIII th century, four towered castle opposite the gateway to the ruins of the fortified village bears witness to this. 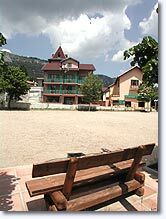 Enjoy a drink at the café terrace or simply sit and relax on one of the wooden log benches on Thorenc's very pretty, brand new square, in the shade of the huge ancient lime trees.â€¦ Maybe this is what people mean by serene happiness? The four-towered castle (15th century fortified manor). 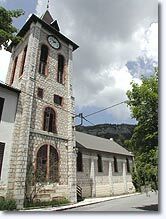 The church in the old village of Thorenc. The Baroque chapel. Remains of the medieval village of Castellaras (access on foot). The distinctive architecture of the village: the Anglo-Russian influence from the beginning of the century. Sainte Marie de Thorenc parish church. The old Notre Dame de Castellaras churc. Hang gliding, para-gliding. Tennis. Fishing. Mountain Biking. Walking & Hiking. Arts and Crafts. Lake. Climbing. Caving. La Ferrière (7km), Valderoure (8km), Séranon (9km), Andon (10km) et Gréolières (14km).